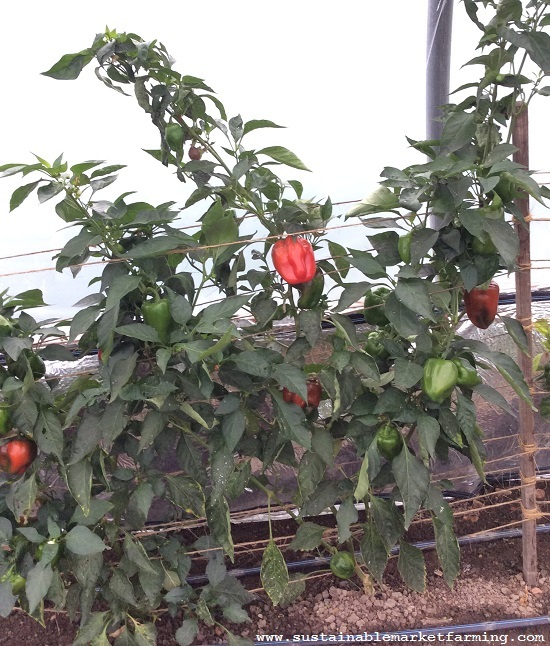 First a photo of a couple of sweet pepper plants in our hoophouse. They are looking a bit “back-end-ish”, but are still producing fruit. We plan our rotation so that the bed which had peppers during the summer is the last to get planted to greens. This lets us get the most peppers possible. Plus, preparing the other beds keeps us fully occupied. This week’s post is a catch up on various topics. I have been busy with speaking events (see my Events page at the tab on this site), and the busiest time of the year in the hoophouse, preparing to plant the winter greens. On the topic of hoophouse vegetable crop rotations, I have just posted something on the Mother Earth News Organic Gardening blog. There are two lovely pairs of photos, winter and summer, demonstrating crop rotations. At the Heritage Harvest Festival I spoke on Feeding the Soil. Here’s my slideshow on that. Click the diagonal arrow icon to view it full screen. Last weekend I presented Season Extension for the Allegheny Mountain Institute Farm at Augusta Health, and I will be presenting that topic again this weekend at the Center for Rural Culture, Goochland, VA 23063. I will include that slideshow in a couple of weeks. Next week is my Alliums for October post. I haven’t found much reading time lately, so a magazine is just the thing! 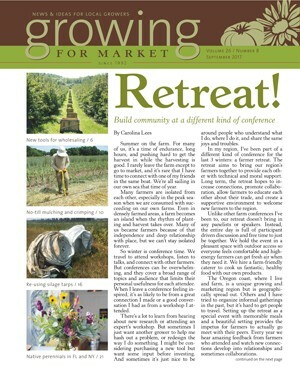 I’ve finished the September Growing for Market and am just moving on to the newly published October issue. The September issue starts with an article on profitable bouquet making (something I’ve never tried to do) by Erin Benzakein. She gives ingredients for each season, “recipes”, and systems for ergonomic working. Spencer Nietmann writes on managing seasonal farm income using a cash projection spreadsheet. If you see yourself heading for disaster, you delay buying equipment and move that expense later in your projection. Simple and effective. No bad surprises! He also advocates for using zero interest credit cards short-term to pay for an expense you are confident you can pay for before the end of the free period. 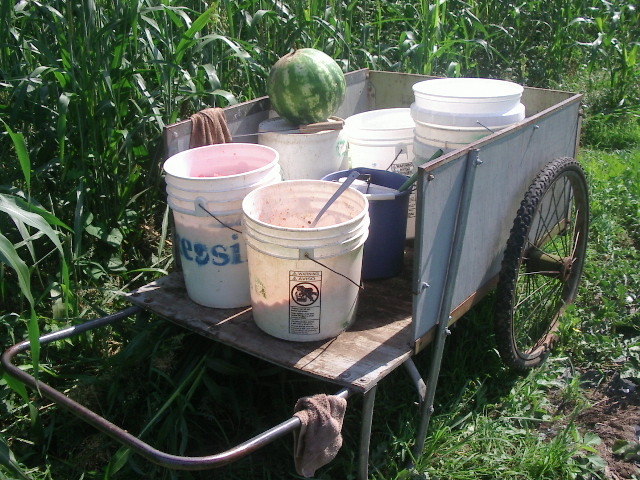 His example is paying for a hoophouse until the NRCS EQIP grant money came through. 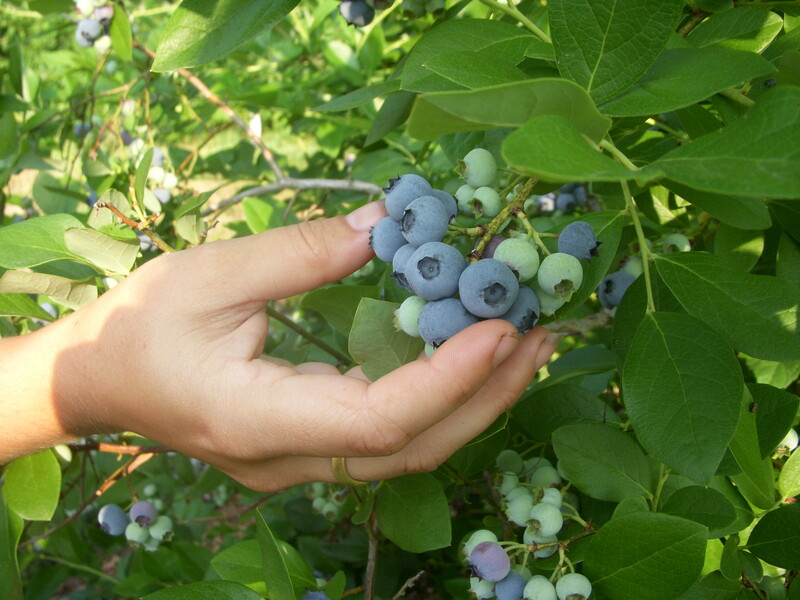 Ellen Polishuk’s Farmer-to-Farmer profile is Blue House Farm in California. Franklin Egan writes on strategies to grow organic matter levels and reduce tillage at the same time. This is to help answer the challenges of some farmers on new land that was previously in continuous industrial corn production. The farmers were growing impressive bulky cover crops in sequence, but needed intensive tillage to get those covers incorporated. This tillage knocked back the organic matter levels each time. They used a farm walk to invite other farmers to suggest improved methods to bring their land into good heart. Sam Hitchcock Hilton wrote about an urban farm in New Orleans using events and farm meals to develop interest in their vegetable sales. It is written in the voice of the farm goat, which adds an entertaining touch. 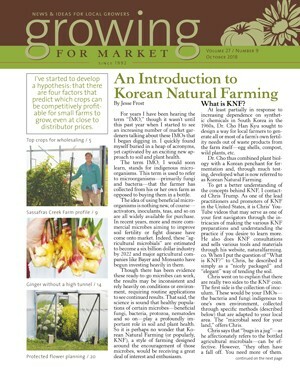 The October issue starts with an Introduction to Korean Natural Farming, which was a new topic to me, and may well be new to most of you. The method includes indigenous microorganisms, or “bugs in a jug” (a fermentation process is used). You can learn how to try this for yourself. 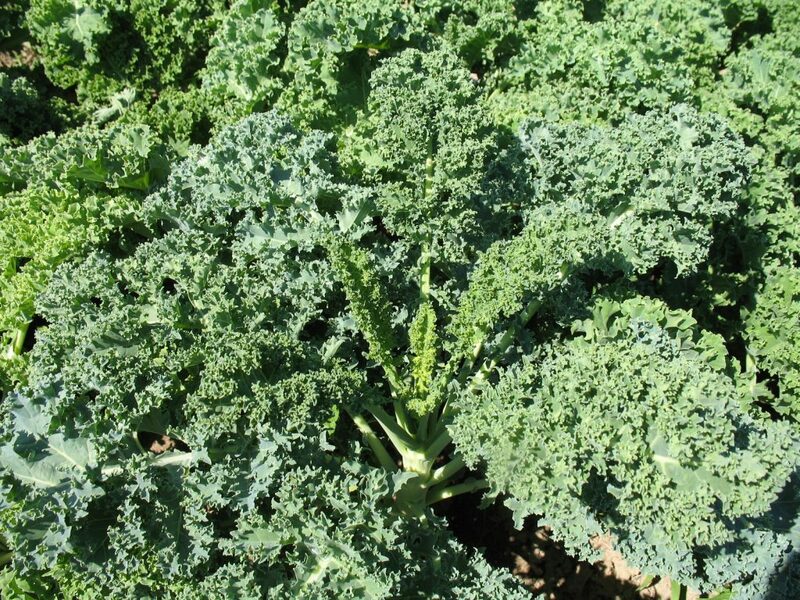 Jed Beach writes about his top crops for profitable wholesaling. 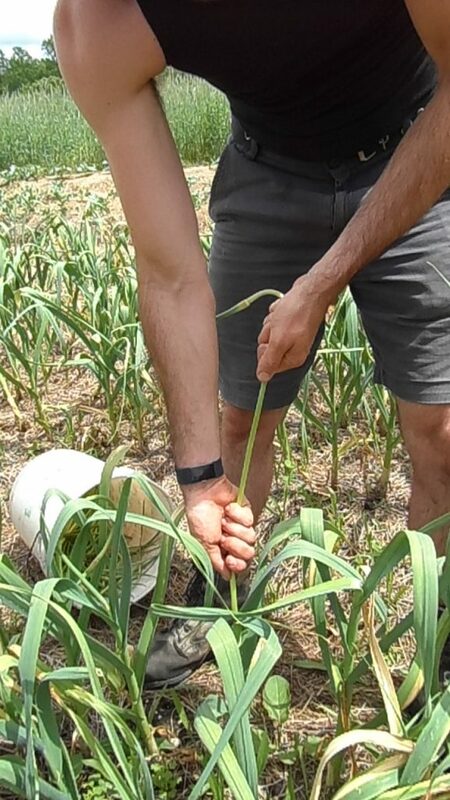 His hypothesis is that “there are four factors that predict which crops can be competitively profitable for small farms to grow, even at close to distributor prices.” Perishability, matching planting to sales, gross sales per square foot and gross per harvest-and-pack hour. He provides a chart of his seven most profitable seven least profitable crops assessed on these factors. Thought-provoking stuff. 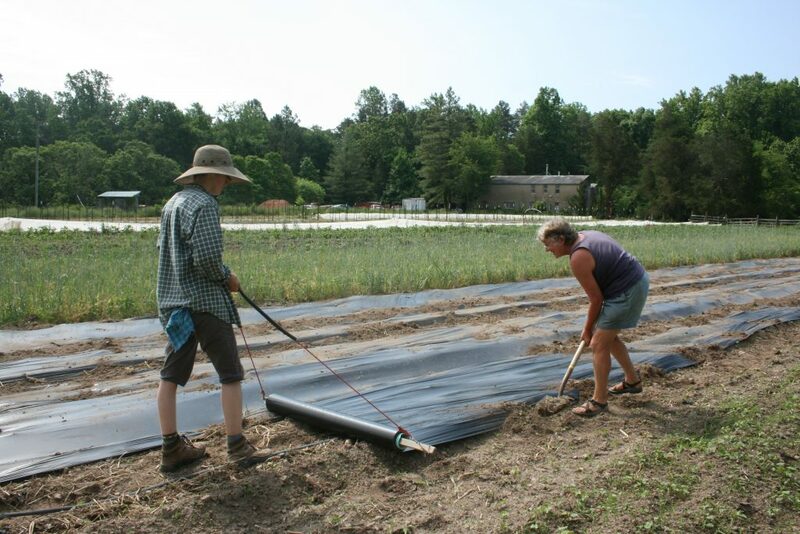 Ellen Polishuk’s Farmer-to-Farmer profile this month is Sassafras Creek Farm in Maryland, with 6 acres of vegetables and 17 acres of grains. The farmers there have a clear system of employment expectations and benefits, and instructions. Half of farm sales come from a farmers market and the other half come from wholesaling to restaurants, natural food stores, caterers and other farms’ CSAs. They decided early on that running their own CSA was not for them. I was startled by the next article: “You don’t need a high tunnel to grow ginger” from three growers in the Midwest. (“Surely you do”, I thought). They used grant money to test out growing ginger in low tunnels, some with in-ground heating coils, some with in-ground foam insulation. Soil temperature is key (60-85F). 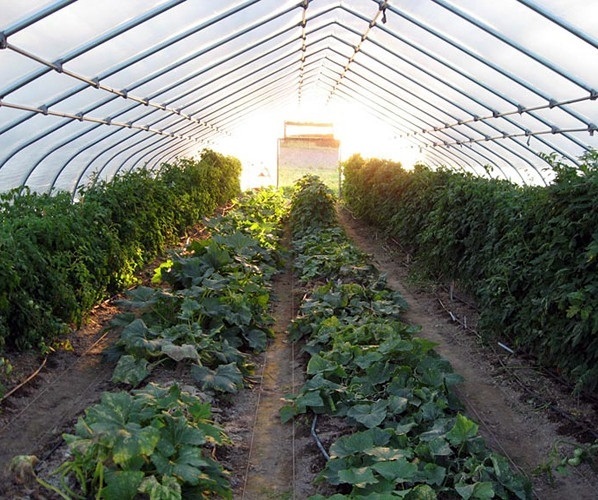 But, personally, I’d still rather have a high tunnel! Doug Trott wrote about planning and ordering now for next year’s flower crops – useful tips for flower growers everywhere. 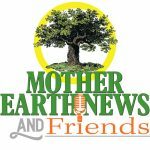 We drove home seven hours from the Pennsylvania Mother Earth News Fair yesterday through the rain. The remnants of Hurricane Florence. We were among the lucky people. Earlier forecasts for Florence had the hurricane raging across central Virginia. At the Fair, I gave two workshops: Fall and Winter Hoophouses and my new Lettuce Year Round, which you can view right here. Click the diagonal arrows icon to get a full screen view. I had a bit too much material for a one-hour time-slot, so those of you who were there and felt disappointed at what I had to leave out, you can see it here. While I as at the Fair I did a FaceBook Live Interview about gardening in hoophouses, with another author, Deborah Niemann. Look on Facebook for Deborah Niemann-Boehle or click the topic link above. She has several books: Raising Goats Naturally, Homegrown & Handmade, and Ecothrifty. Meanwhile, Mother Earth News tells me that my post 20 Tips for Success in Germinating Seeds in Hot Weather is in third place for most popular posts this summer. The winner An Effective and Non-Toxic Solution for Getting Rid of Yellow Jackets’ Nests by Miriam Landman got 43,328 views in 3 months! 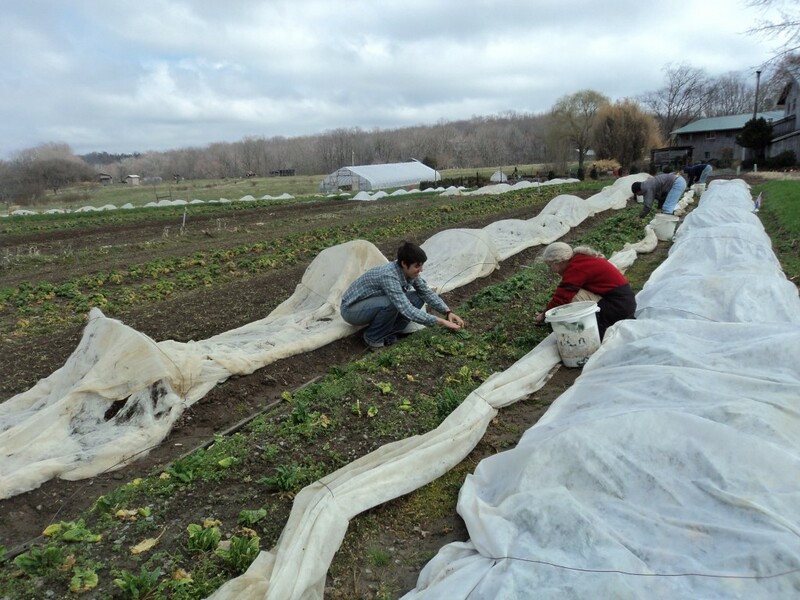 Weeding rowcovered spinach in winter. 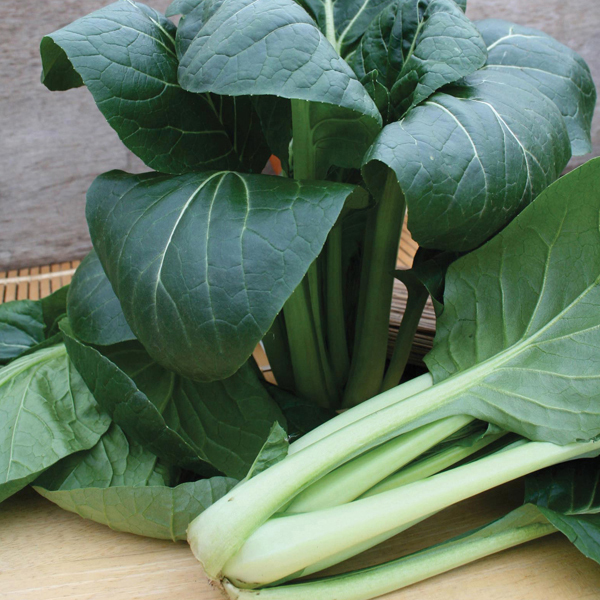 Winter Kill Temperatures of Winter-Hardy Vegetables 2016. How to deal with green potatoes is still #3. I’ve updated my Events page again, now that the September- April “Events Season” has hotted up. I’ve added in a couple of new ones and updated some others. Click the Events tab to find conferences and fairs near you, and be sure to come and introduce yourself! Ira Wallace of Southern Exposure Seed Exchange, at the Heritage Harvest Festival Tomato Tasting. I’m giving a Premium Workshop on Friday Sept 21, 3-4 pm Classroom 7. Click the link HERE to book for that. 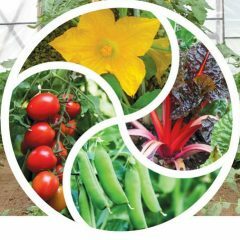 In this workshop I will introduce ways to grow and maintain healthy soils: how to develop a permanent crop rotation in seven steps, and why your soil will benefit from this; how to choose appropriate cover crops; how to make compost and how to benefit from using organic mulches to feed the soil. Handouts. Book-signing Friday 4.15 – 4.45 pm. On Saturday there are events all day from 10am to 5pm. $26 general admission. I’m giving a two-hour Class on Season Extension, followed by one-hour Q&A teaching tour of the hoophouse and greenhouse. Wet Roma tomato seeds set to dry with a fan. Last week I wrote about saving tomato seeds and eating the tomatoes too. 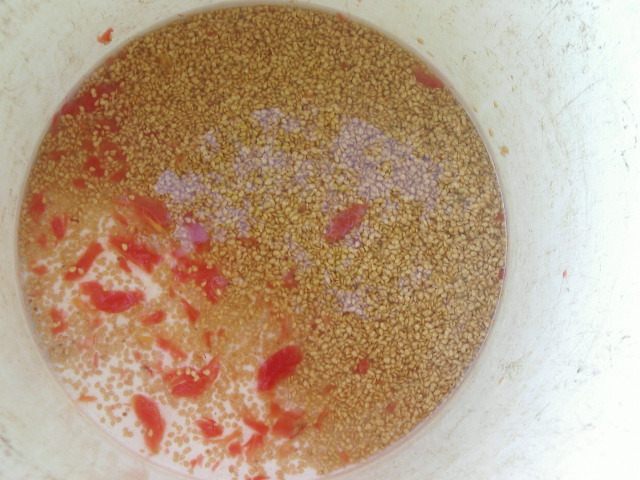 We left the extracted tomato seed in a bucket to ferment for three days. On Friday I washed the seeds. They look quite unappetizing at first, with a thin layer of mold on the surface of the liquid. Roma tomato seed ferment on day 3, ready for washing. The process of washing the seeds and pouring off the detritus is almost magical. 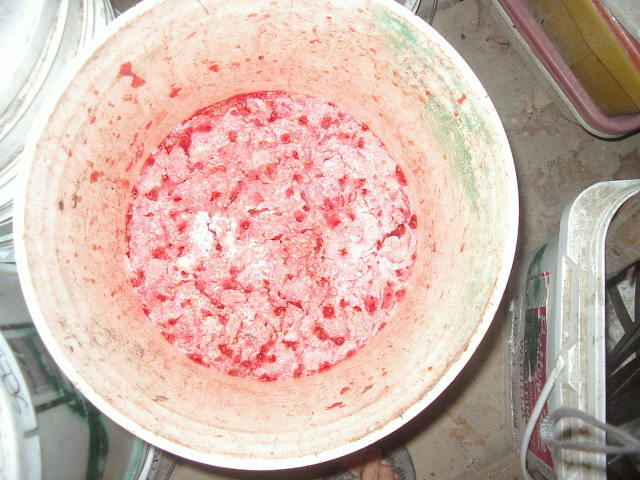 The fermentation kills some disease spores, and also dissolves the gel that coats the seeds. If you dry tomato seeds without fermenting, they all stick together. 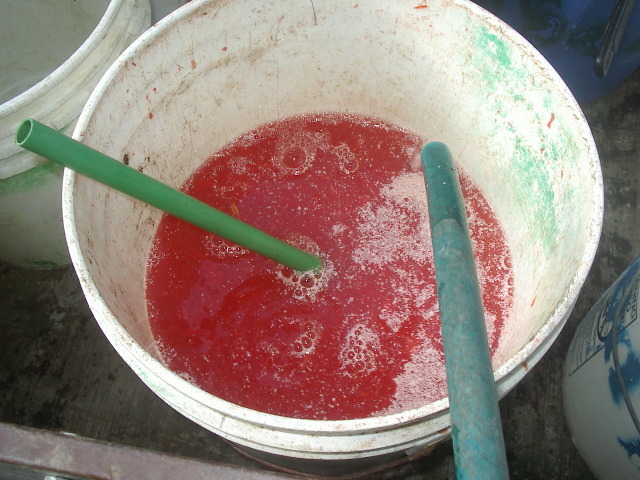 Tomato seed processing: adding water from a hose and stirring the mix. 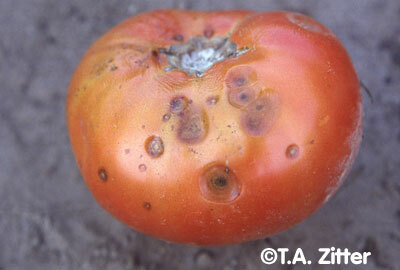 With each successive wash, more of the tomato flesh floats off, along with poor quality seeds. I add water using a hose and stir. Here I’m stirring with a short length of green plastic pipe that was conveniently nearby. When the bucket is about two-thirds full I turn off the hose and stop stirring. Good seed sinks to the bottom of the bucket. 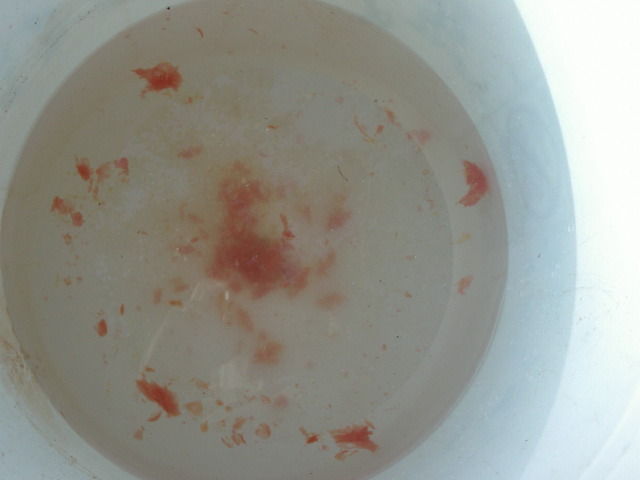 When I think it has settled, I pour the liquid along with lumps of tomato flesh into another bucket. This is a safety precaution to ensure I don’t throw away good seed. If I just poured it on the ground I could slip and dump the lot. Roma tomato seed ferment after first pour. I repeat the wash and pour a few more times. Even after the second pour the seeds are plainly visible. 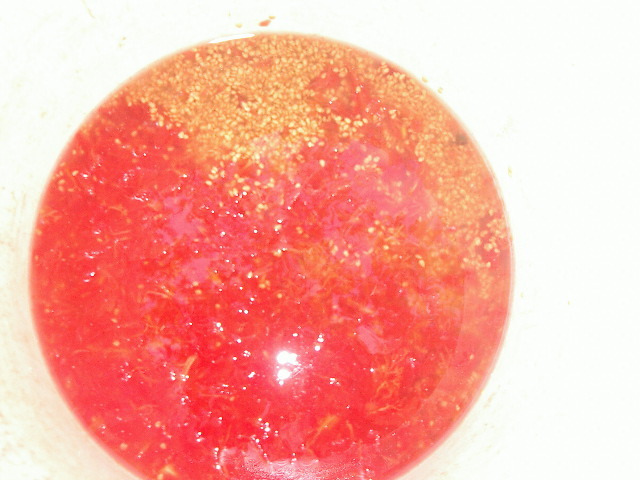 Roma tomato seed ferment after the second pour. The seeds which float and get poured away are very light and are either very thin or they show a black spot in the center. So it’s counter-productive to try to catch every single seed.Let the useless seeds float away! Tomato seed extraction after the third pour. After four or five washes the water I pour off is clear, so then I add more water, stir and pour the swirling stuff through a sieve balanced on a bucket. 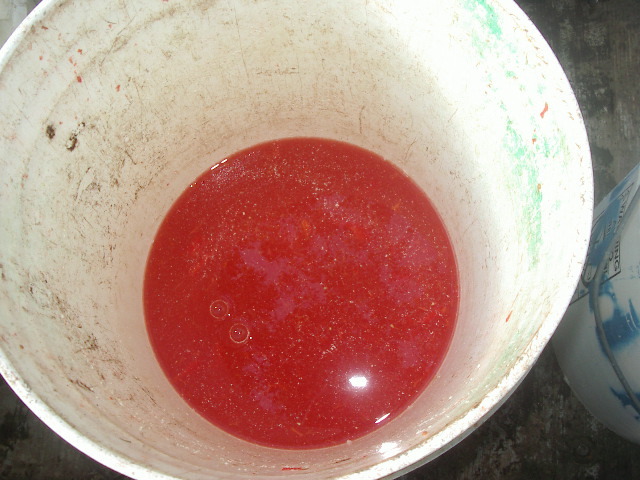 Tomato seed extraction, fourth wash water. almost clear. In my case I have a small sieve balanced in a bigger one, which sits more safely on the bucket, but has a mesh too big for tomato seeds. 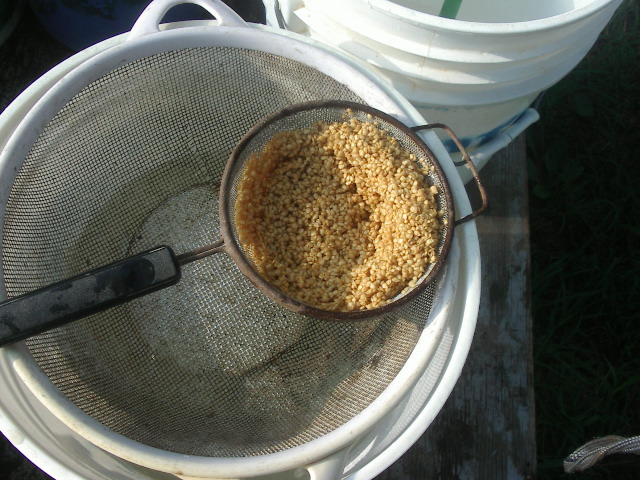 This sieve contains seed from 10 gallons of Roma tomatoes. Roma tomato seeds strained in a sieve. From here, I take the seed sieve indoors and empty it on sturdy paper towels on a tray by a small fan. See the first photo. 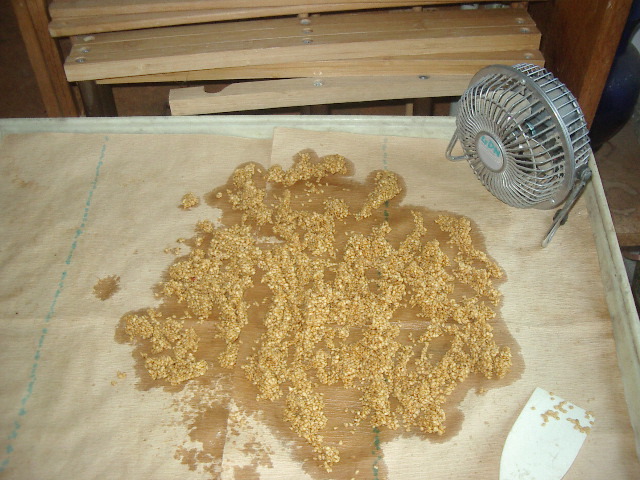 After a few hours I come by and crumble the clumps of seeds to help even out the drying. For two days I turn the seeds over a few times a day. Once they are dry I put them in a labelled paper bag, and ready the space for the next batch of seeds to dry. 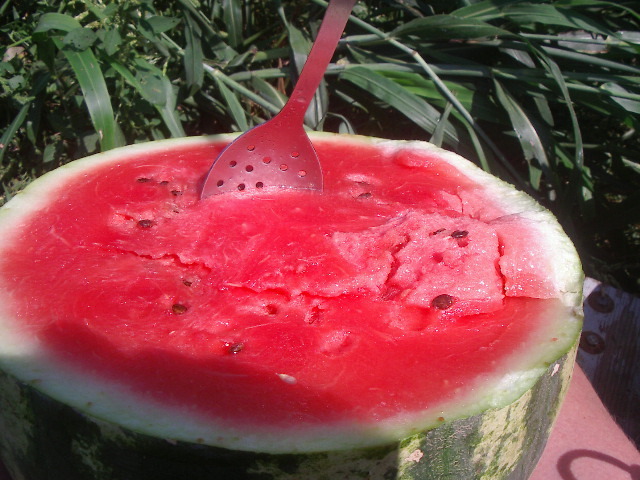 Watermelon in this case. 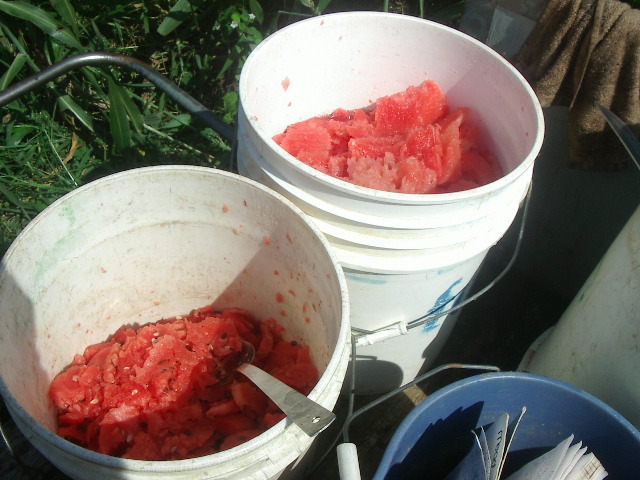 I alternate tomato and watermelon seeds, processing one batch of each every week through late July to early September. I mentioned the Heritage Harvest Festival a few weeks ago. I’m presenting one of the Premium Workshops on Friday, about growing sweet potatoes. See my Events Page for more about this. Pictures of sweet potatoes at this time of year are a monotonous swath of green leaves (now we have got a double electric fence to stop the deer eating the leaves off.) Last year we didn’t do a good job of keeping deer off our sweet potatoes and we got low yields. One of our gardening mantras is “Never make the same mistake two years running!” so you can be sure we are working hard to keep the pesky deer from eating our winter food. On Saturday September 9, I’ll be out and about at the Festival, and hope to see many old friends and make some new ones. If you live in North Carolina and can’t make it all the way to Virginia for the Heritage Harvest Festival at Monticello, you could go to the Organic Growers School Harvest Conference that same weekend September 8-9. I’ve been to their Spring Conference several times, but never the Harvest Conference because it’s always the same weekend as the Heritage Harvest Festival. 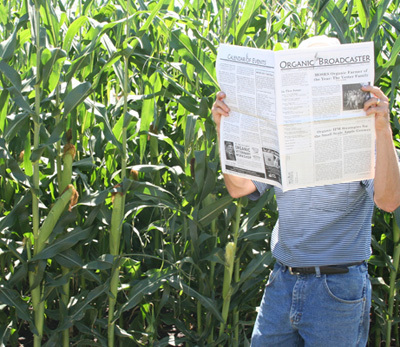 The July/August issue of Organic Broadcaster has been on my desk for a few weeks waiting for time to read it. This newspaper is free online, with a new issue every two months. 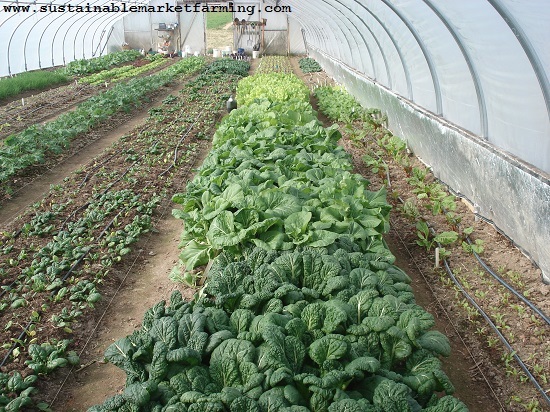 It covers more aspects of Organic Farming than simply vegetable production. There are good articles about cover crops, including roller-crimping no-till rye. Also an article on weed control for market farmers by Bailey Webster, who interviewed farmers and researchers. Harriet Behar, the senior organic specialist at MOSES, write about the thorny issues of falsely labeled Organic foods: imported livestock feedstuffs, milk from cows with no pasture access and algal oil in Organic milk. Now that 68% of Americans bought organic foods of some kind (Pew), more Organic suppliers are needed to meet the demand (or else the unscrupulous rush in with false labels.) There are further articles about cash flow for farmers, winter bale grazing for cattle, the 2018 Farm Bill, and transferring the farm to new owners. Now we are getting some rain from Cyclone 10, which might have become Tropical Storm Irma, but now looks less likely to qualify for a name. But, enough rain to want to stay indoors, so maybe I can read for a while. After a couple of summer months off from speaking at events, I am gearing up for the Heritage Harvest Festival at Monticello, near Charlottesville. This two day festival has a day of ticketed workshops on Friday September 8 and a field day on Saturday September 9. Saturday workshops, demonstrations, tours and kids events are all included with the price of admission. 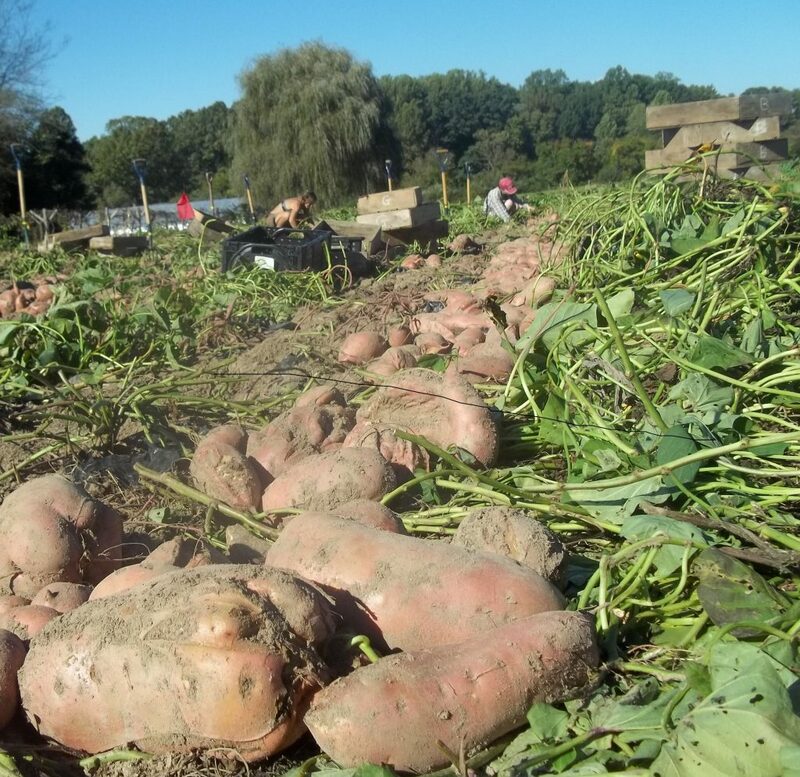 Never been to Monticello’s annual Heritage Harvest Festival? What exactly is it? Get your tickets now to join in 9/8-9/9. You’ll find a variety of interesting events and workshops focused on all things related to gardening, cooking and food. You can learn everything from how to make cider, how to keep your garden alive throughout the winter, or even how to become a chicken whisperer. There is something for everyone! See the schedule of events here. 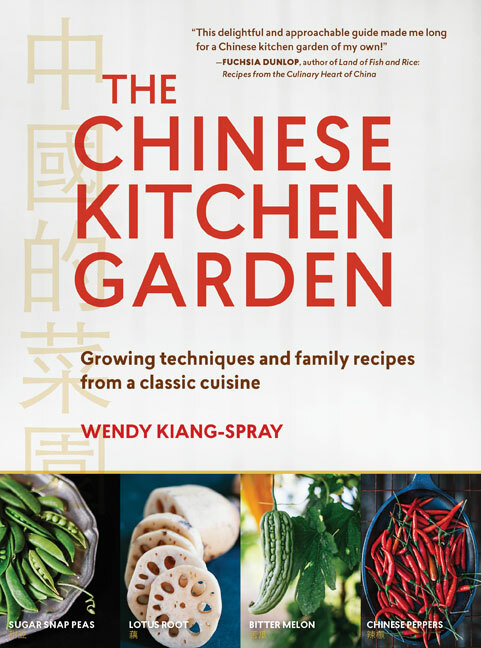 This year I am presenting my workshop Growing Sweet Potatoes on Friday at 3.30 pm, followed by book-signing at the Bookshop at 4.45 pm. Bring your grubby well-thumbed old copy of Sustainable Market Farming for me to sign, or buy a fresh new one for yourself, or as a gift, at the Bookshop. 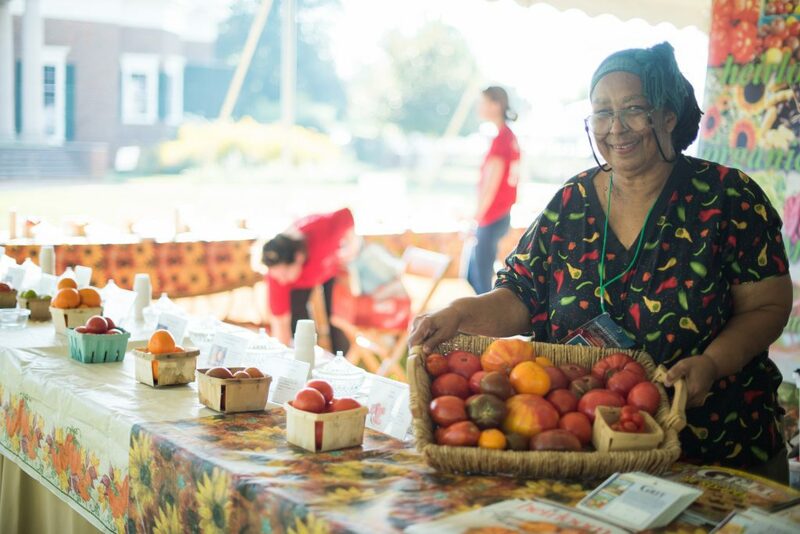 Harvest Festival and learn more from Ira Wallace, one of the founders of HHF and worker/owner of the Southern Exposure Seed Exchange. 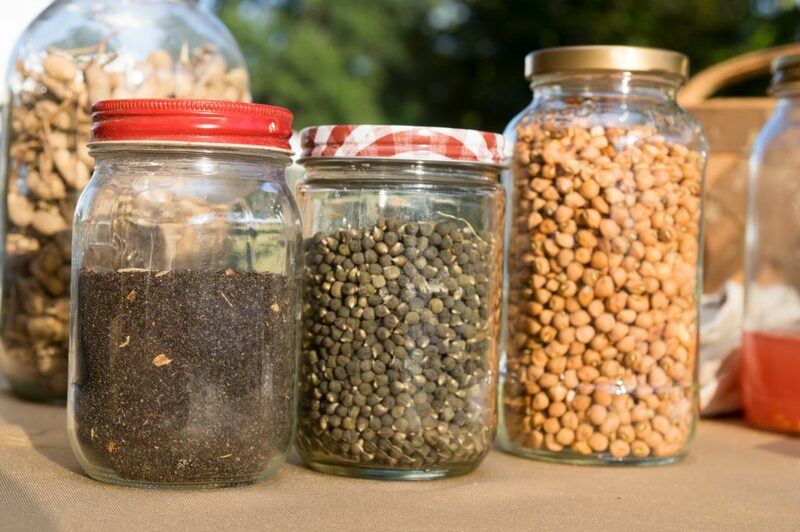 Seed savers of all levels are welcome! #HHF2017. 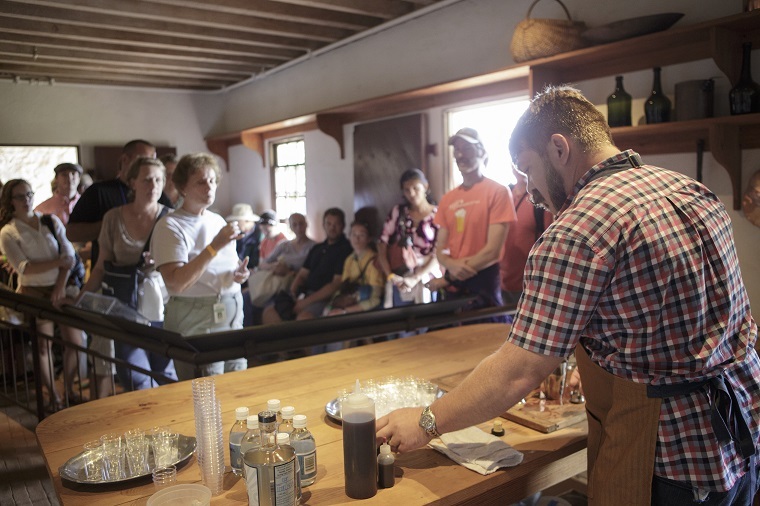 Tour Monticello’s 1,000-foot-long vegetable garden: an “Ellis Island of edible curiosities” at this year’s Heritage Harvest Festival . Peter Hatch giving a tour of the Monticello vegetable garden. Come and sample more than 100 varieties of heirloom tomatoes, heirloom peppers and melons in the Tasting Tent. My next event after that will be the Carolina Farm Stewardship Association Sustainable Agriculture Conference. November 3-5, 2017 in Durham, NC. I will be talking about hoophouse growing, both in the Friday morning pre-conference and on Sunday. See my Events page (tab) for more. Cucumbers and squash in our hoophouse. I’m doing fewer speaking events this fall/winter/spring season. 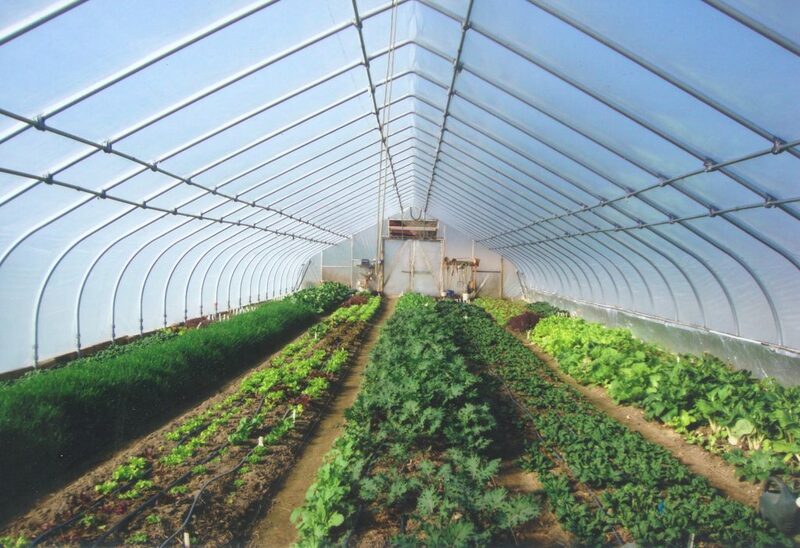 I’m writing my second book, on year round vegetable production in hoophouses. I need to stay home and write, take photos, write some more, edit, draw diagrams, write more, make charts, etc. The week of August 6-12 has been declared National Farmers’ Market Week by the Farmers’ Market Coalition. It’s a great time to reflect on the importance of farmers’ markets to our communities and pledge to support our local markets, farmers, and vendors. As demand for local food continues to grow, so too have the opportunities for America’s farmers to market fresh food directly to the consumer. The number of markets listed in the United States Department of Agriculture’s Farmers’ Market Directory has grown from 2,863 in 2000 to 8,675 in 2016. According to statistics recently released by the USDA, farmers’ markets and farm stands account for roughly $2 billion of the $3 billion that Americans spend annually on direct-to-consumer farm product sales. This revenue, in turn, supports the livelihoods of more than 165,000 mostly small and mid-sized farms and ranches. Farmers’ markets strengthen rural economies. According to the Farmers’ Market Coalition, farmers selling locally create 13 full-time jobs per $1 million in revenue earned, compared to three jobs created by farmers who don’t sell locally. Farmers’ markets provide a low-barrier entry point for farmers and food entrepreneurs who are just starting out and/or want to test new products by getting feedback directly from customers. Farmers’ markets support healthy communities by increasing access to fresh, nutritious, and flavorful food. Markets also provide important opportunities for social interactions and vendors help educate the non-farming public about agriculture and local foods. So, support your local Farmers Market, unless you grow all your own food! You can probably find something to buy, or some way to offer help. Or buy a farmer a cup of tea! Late carrot sowing, plenty of corn and okra, spotty tomatoes. Newly emerged carrots with indicator beets. We finally got our big planting of fall carrots sown. Much later than I’ve ever sown carrots before. Our goal is early August, so we are a month behind. 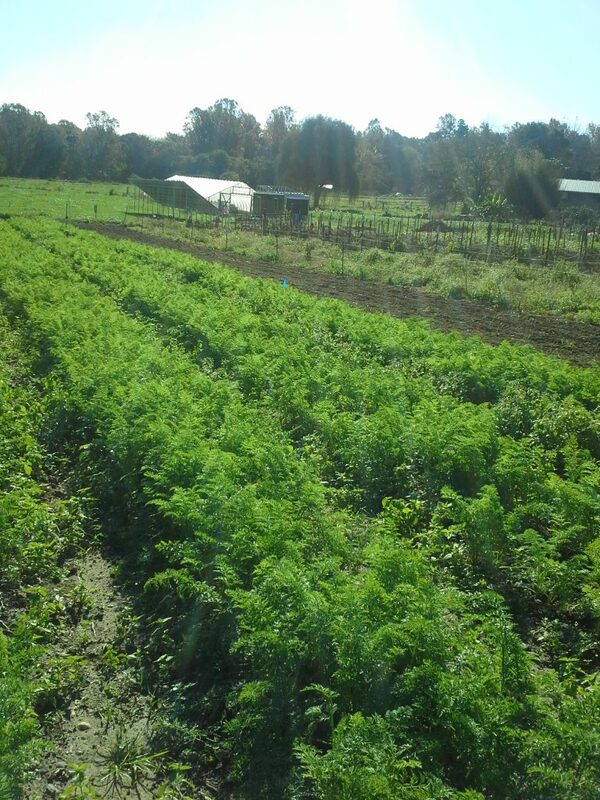 We usually harvest all our carrots at some point in November and store them for the winter. If carrots take 75 days to grow and we’ve lost 30, how big will the carrots get? The rate of growth will slow as it gets colder.We can’t just harvest a month later and expect the same size carrots as usual. It’s not a linear rate of increase. 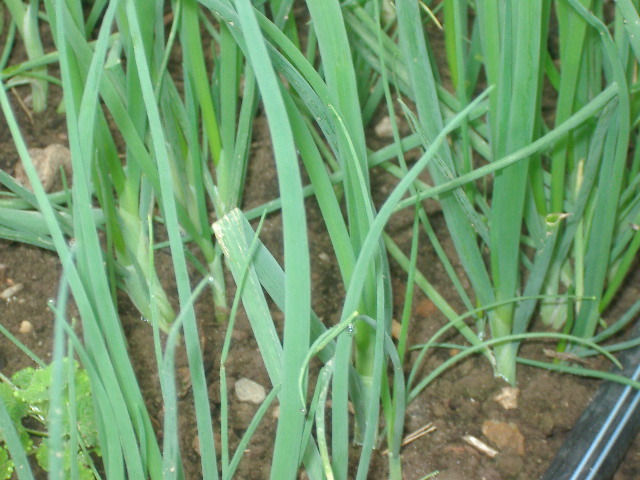 Some crops double in size in their last month of growth. if that’s true of carrots, we’ll get about half the yield we usually do, if we harvest at our usual date. We had challenges preparing the soil (too much rain, too many grass weeds, not enough rain, not enough time. . . ). This morning we finally got it all raked and rocks picked out, and seeds put in. We mark the beds with the Johnny’s rowmarker rake five rows in a four foot wide bed. Then we sow with an EarthWay seeder. It’s very quick and easy. We sow about 12″ of beet seeds at one end – these are our “Indicator Beets”. When the beets germinate, we know the carrots will be up the next day and it’s time to flame weed the carrot beds. Once you get over the hesitation about using a fiercely hot propane burner, flame weeding is also quick and easy. And boy, it saves so much hand weeding! We bought our Red Dragon backpack flame weeder from Fedco. As you see, we decided to use wheelbarrow rather than carry the propane tank on our backs, and include a second person (and in this picture, a third!). The second person is the safety monitor and looks out for unwanted things (like hay mulch burning). I did a bit of research on last sowing dates for carrots in our area. 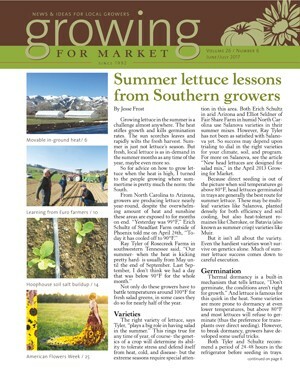 Southern Exposure Seed Exchange in their useful Fall & Winter Vegetable Gardening Quick Reference suggests 8/31. We’re five days later than that. The National Gardening Association on their customizable Garden Planting Calendar for our zipcode comes up with September 4. The news is getting better! 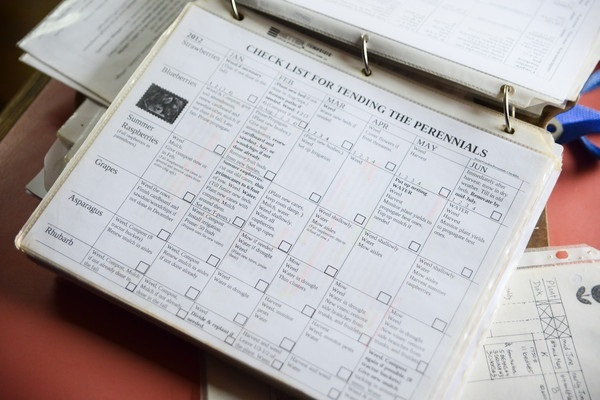 They have planting dates for spring and fall, in a very user-friendly format. The How Do Gardener Page says August 31 is the last planting date for carrots in Virginia. Fingers crossed! 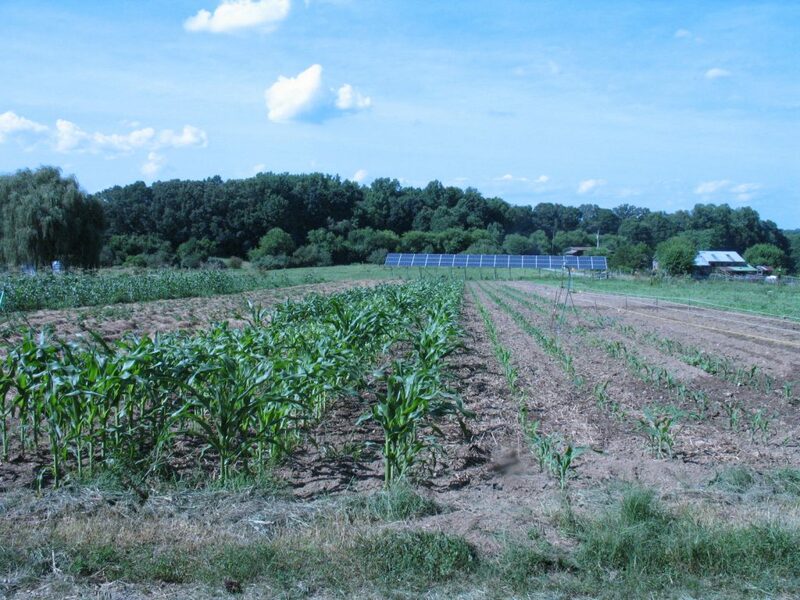 Sweet corn plantings 3, 4 and 5 (left to right, 4 rows of each) earlier this summer. Planting 5 is under the ropes to the right. Meanwhile our sweet corn is doing very well. We’re eating the Bodacious sweet corn and the Kandy Korn of our fifth sowing. In a couple of days the Silver Queen of our fifth sowing will be ready. After that we have sowing number 6, the same three varieties. That’s it: six sweet corn sowings through the season. Another crop being very successful is okra. We grow Cow Horn okra from Southern Exposure. We like it for its tall plants, high productivity and the fact that the pods are tender at 5-6″. 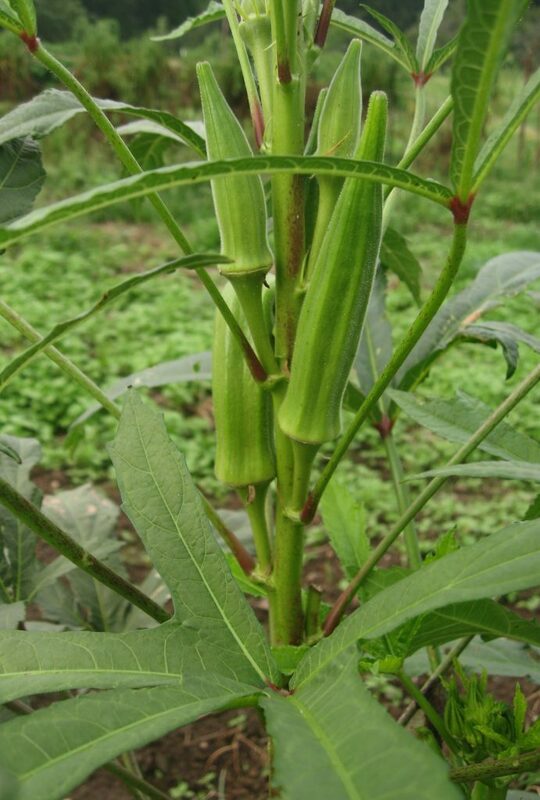 We do find it hard to convince our cooks that we have specially chosen this “commune-friendly” variety so they don’t have to deal with fiddly little okra pods when cooking for 100. We used to harvest at 5″, we’ve had to compromise and harvest at 4″. While we were determining what was wrong when our plants got hit with some hot weather herbicide drift, we didn’t touch the plants in case it was a viral disease. We didn’t do the string weaving. The plants sprawled on the ground. Later we made a bit of an effort to catch up but failed. The plants were a sprawly mess, even though the foliage recovered and the plants were loaded with fruits. Far too much contact with the ground! (Even though we used the biodegradable plastic, each plant had a hole in the plastic, and soil ‘appeared’). I also noted that anthracnose is more prevalent on poorly drained soils, and the area we had planted in was one of the lower lying plots, and July had lots of rain. 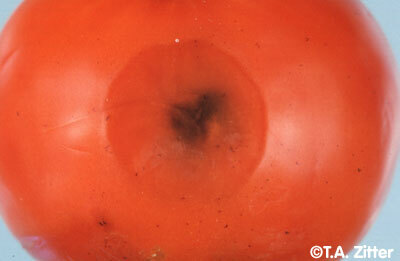 Water-soaked circular sunken spots of anthracnose (Colletotrichum coccodes) usually appear on the shoulders of mature fruit. Well, lessons learned! Fortunately our other tomatoes on higher ground didn’t get anthracnose, and some of them will feature in Southern Exposure‘s Tomato Tasting at the Heritage Harvest Festival this weekend. 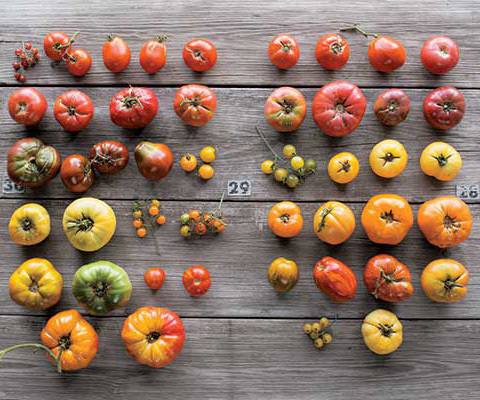 An amazing array of tomatoes. 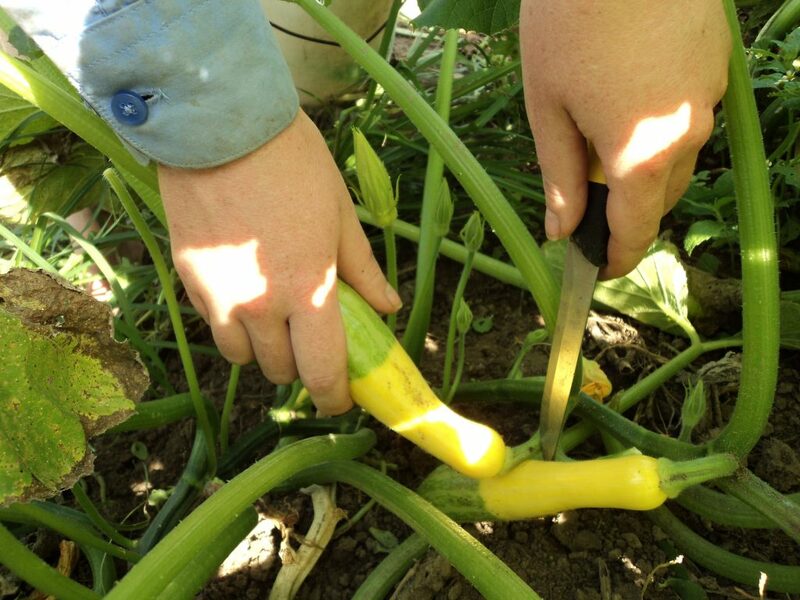 Author farmerpamPosted on September 6, 2016 Categories Sustainable vegetable production, This week in the gardenTags Bodacious sweet corn, Cow Horn okra, Craig LeHoullier, EarthWay seeder, Epic Tomatoes, Fall & Winter Vegetable Gardening Quick Reference, fall carrots, Fedco, flame weed the carrot beds, flame weeding carrots, Garden Planting Calendar, herbicide drift, heritage harvest festival, How Do Gardener Page, indicator beets, Johnny's rowmarker rake, Kandy Korn, last sowing dates for carrots, National Gardening Association, rate of growth will slow, Red Dragon backpack flame weeder, Silver Queen, six sweet corn sowings through the season, southern exposure seed exchange, spotty tomatoes, string-weaving, Tomato Tasting, Vegetable MD-Online6 Comments on Late carrot sowing, plenty of corn and okra, spotty tomatoes. Heritage Harvest Festival soon! meanwhile in the garden . . . 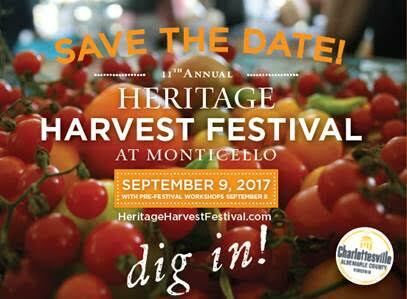 The Heritage Harvest Festival at Monticello, near Charlottesville, Virginia, is coming right up. Friday September 9 and the main day Saturday September 10. I’ll be presenting two workshops, Fall Vegetable Production and Crop Rotations for Vegetables and Cover Crops. This is my first speaking engagement of the fall/winter/spring season. I have plans to make an Events Page, but our internet speed is still glacial, due to our tower having been struck by lightning, so I’ll wait on that. 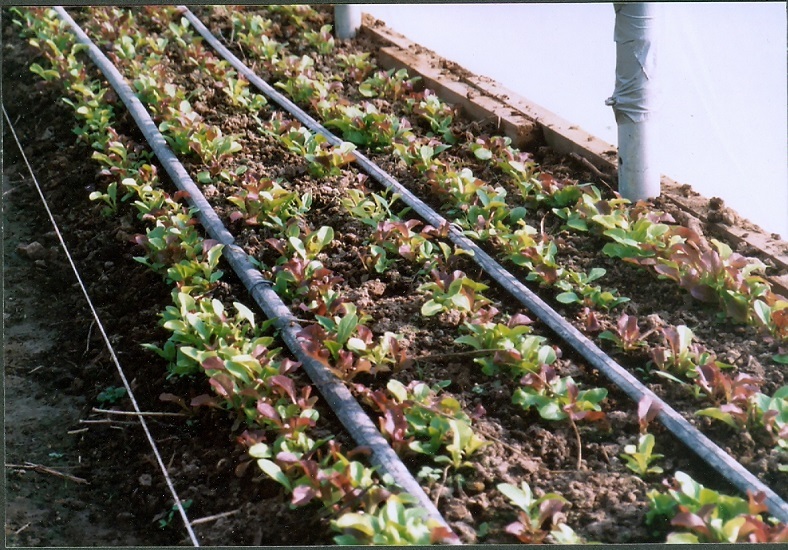 Better Times: Lettuce Seedbed with Concept, De Morges Braun, New Red Fire and Loma lettuces. Meanwhile in the garden, we have been having a challenging time. Cutworms mowed down our lettuce seedbed. We lost several weeks’ worth of lettuce at once, (all our October and first week of November lettuce). 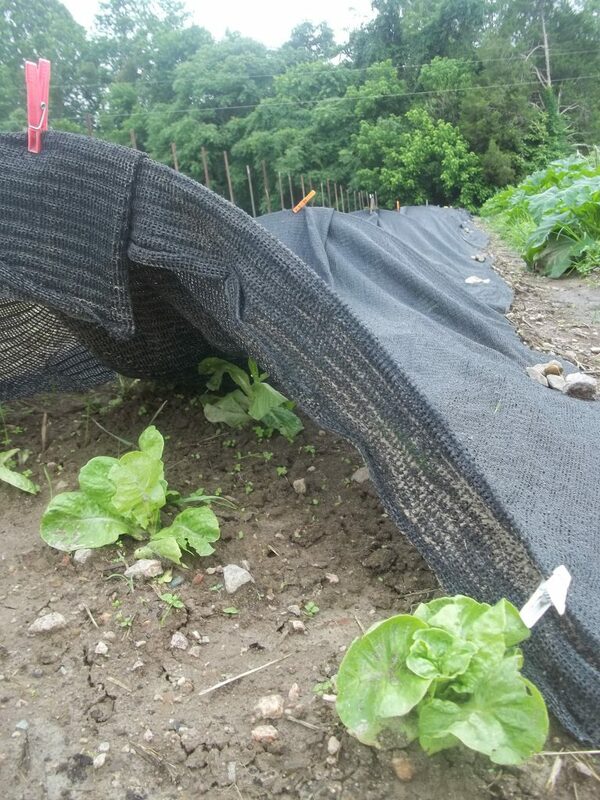 To prevent further depredations, I started sowing lettuce in flats, up off the ground on a metal frame I had handy. That should provide lettuce for late November and December. What to do in the meantime? 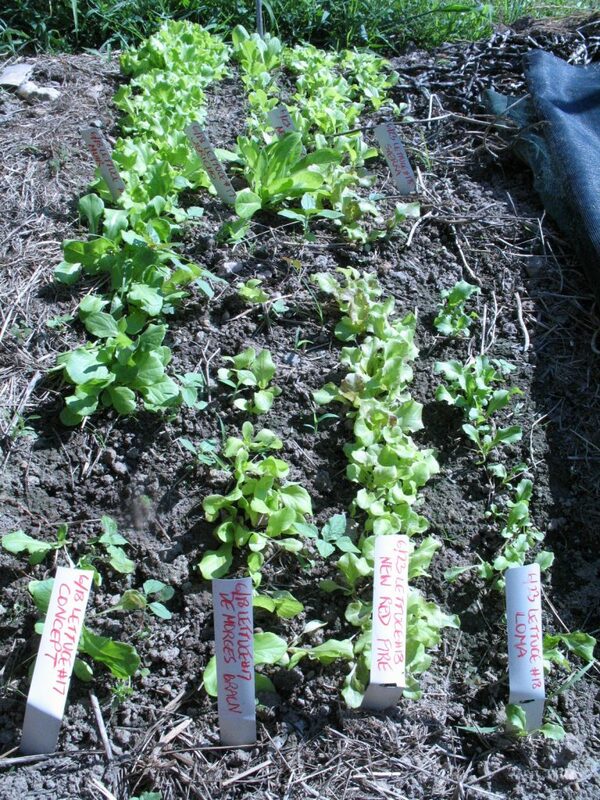 I decided to direct sow some custom baby lettuce mix in the bed where we would have transplanted the missing lettuce. We’ll eat this at a young stage, so perhaps it will help us catch up. Baby lettuce mix in our winter hoophouse. 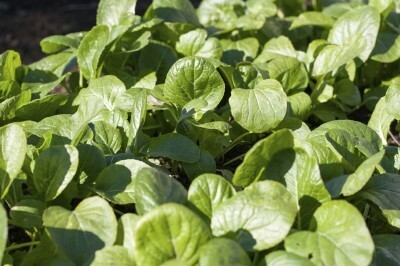 We don’t usually grow baby lettuce mix outdoors, only in the winter hoophouse. We have to work hard to get lettuce to germinate in hot weather. But cooler weather is due here in a couple of days and I’ve already seen baby henbit seedlings coming up, a sign the soil is cooling down. 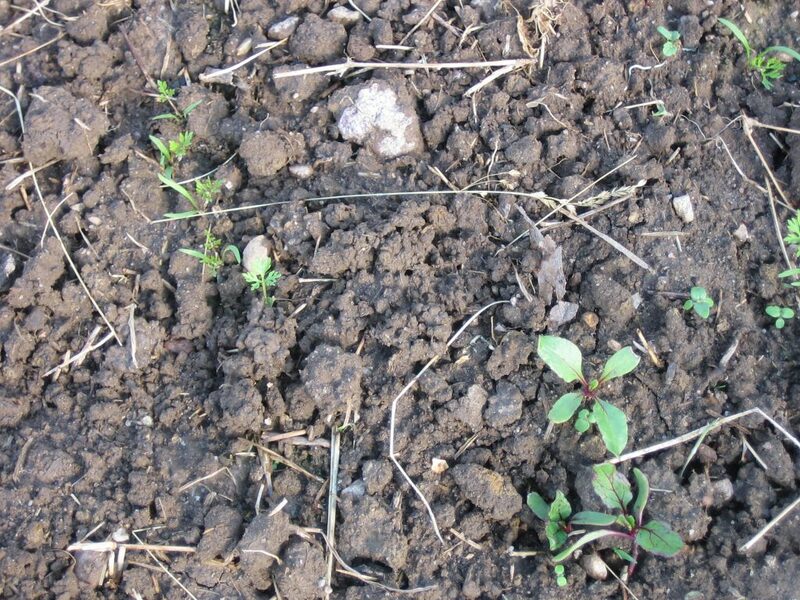 I always watch for henbit, chickweed and dead nettle germinating as fall approaches, as they tell me when I can start thinking about sowing spinach. Henbit is a spring and winter annual weed here. Sometimes people confuse henbit, ground ivy and dead nettle. Here’s a really useful blogpost from Identify that Plant on distinguishing these three easily mixed up early spring plants. 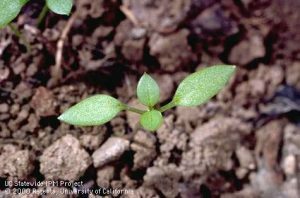 This site has really helpful photos, although of course, we are not looking at full sized flowering plants now, but tiny two-leaved seedlings. 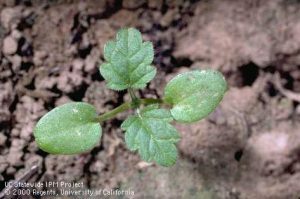 Here are photos of chickweed, henbit and dead nettle seedlings. These are the three I look for when deciding if the conditions have become suitable for sowing spinach. This last photo comes from a Danish website, but have no worries – they have thoughtfully written in English. See how closely the dead nettle seedling resembles the henbit? And see the differences, the way the seed leaves come off the petioles, and the overall shape of the true leaves? I see I’ve written a lot about lettuce again. And weeds again. And some doom and gloom. So here’s some good news. Our okra is doing really well, and so is our sweet corn! Our internet is too slow to let me include photos of those. 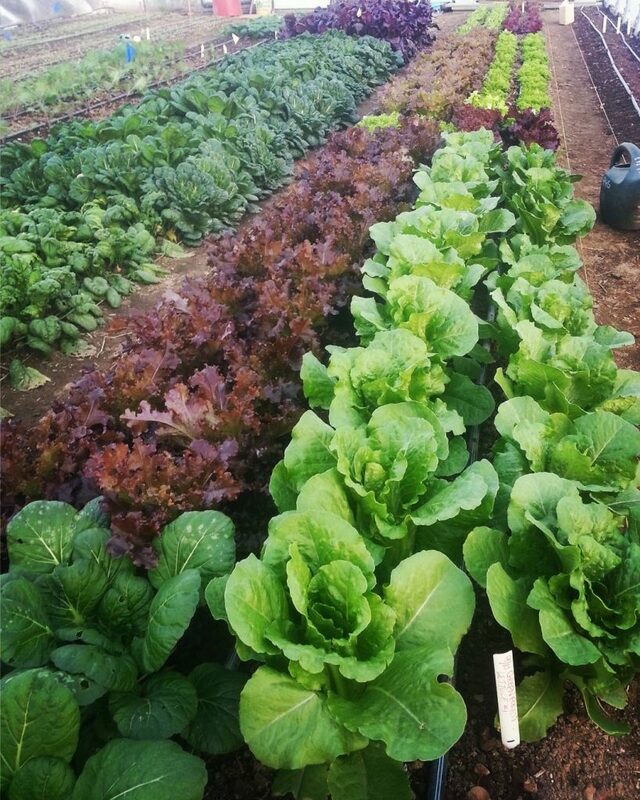 Author farmerpamPosted on August 29, 2016 Categories Events, Slide shows, Sustainable vegetable production, This week in the gardenTags Crop Rotations for Vegetables and Cover Crops, Cutworms mowed down our lettuce, Fall vegetable production, get lettuce to germinate in hot weather, Henbit seedling, heritage harvest festival, Identify that Plant, lettuce seedbed, monticello, Plantevaern Online, Purple dead nettle seedling, start thinking about sowing spinach, three easily mixed up early spring plants, UC IPM Weed Gallery1 Comment on Heritage Harvest Festival soon! meanwhile in the garden . . .